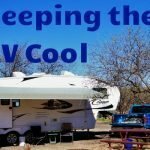 Over the years I’ve been contacted by numerous people asking “What things should I check when buying a used RV?“. To help folks out, I decide to write up this checklist style blog post. 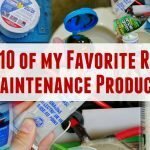 Hopefully, it will give you a starting point on your road to a “new to you” RV. 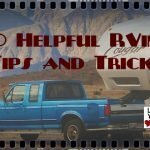 This list is based on my experience owning a fifth wheel trailer, but many of the tips are transferable to any form of RV. These checks should help you quickly narrow down your prospective RVs without always paying for an inspector each time. Once you have your eyes set on an RV (for most people) I still recommend hiring a pro for a final inspection. 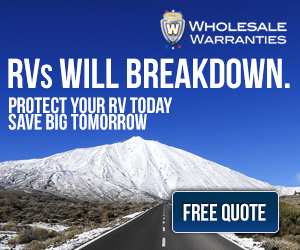 One of the most important pre-sale checks you can make on an RV is up on its roof. A leaky RV roof can cause massive damage often hidden from casual view. Rot inside the walls can weaken the whole structure, and unseen mold can make you sick. Both of these problems are usually expensive and time-consuming to have repaired. If you aren’t comfortable accessing the roof it’s well worth hiring someone who is. *Important* Before climbing check the mechanical condition of the ladder for loose screws or cracked rung holders. All seams and joints for cracks. Check roofing material for damage like rips, tears or worn spots. State of the sealants and caulking. Does it look old and dried out? Pay particular attention to where the water naturally pools. Front and back seams are notorious spots for a leak. Pull all vent covers and have a look at the seams underneath. Get a hose up there and spray it down well, make sure the gutters are in working order shedding the water. Listen for drips inside the RV. Pull off the waste tank and fridge vent covers. 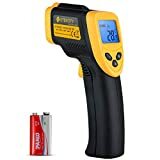 With a powerful flashlight peer down into the vents checking for any blockages such as a bird, rodent or insect nests. Much the same as the roof, check all window seams and sealants. Make sure the rubber gasket seals and bug screens are in good shape. Spray with high-pressure water and check for internal leaks. If the windows have films on them, check for cracking or delamination. If windows are double paned look for any fogging in between that would indicate a failure. Have a close look at entrance doors, cabinets, and drawers. Look for any missing hardware, damage or loose screws. Make sure the locks and latches are in working order. Go around the RV inspecting the walls looking for any cracks, delamination, bubbles or bulges. Check condition of the decals. Look closely at all the seams making sure the sealant/caulking is clean with no cracking or peeling. Check for possible loose molding and mounting screws. Make sure all the walls look square and true. A section of wall that looks like it is out wack is usually a sign of underlying frame damage. Cracks are another sign. Check each AC breaker. They should feel stiff when switching. Run all the circuits and check for excessive heat on any of them. For the 12 Volt DC circuits make sure there are no blown fuses. Have a look at each fixture. Make sure they are in working order. Pull the covers and confirm the bulbs are in good shape, and there are no signs of overheating to the plastic holders or metal connectors. Don’t forget to check all the exterior and storage bay lighting too. Inspect the main power cord for defects. Pay close attention to the metal plug prongs. Make sure none of them have arc damage. 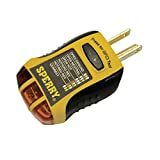 Using an inexpensive circuit tester go around and check all the AC outlets in the rig. Don’t forget the outside ones as well. Locate the coach battery bank, usually, found in its own vented box. Make sure there is no corrosion on the connections, and the wires are in good shape with no signs of overheating. With a multimeter look for a voltage measurement of between 12.6-12.8 volts when not plugged in. If the battery is a lead acid type then test of each cell with a hydrometer to get a more accurate state of charge. Also, look for a date code on the battery labels. If older than 5-7 years there is likely not much life left in them. Remove the AC covers. Inside: Inspect for any signs of water leaks from the roof gasket and check for a filter in good condition. A gummed up filter is a sure sign the AC unit has never had even basic maintenance. Outside: On the rooftop inspect the condenser and evaporator fins for damage and make sure they aren’t clogged with debris. Check the wiring, electrical connectors and fan. 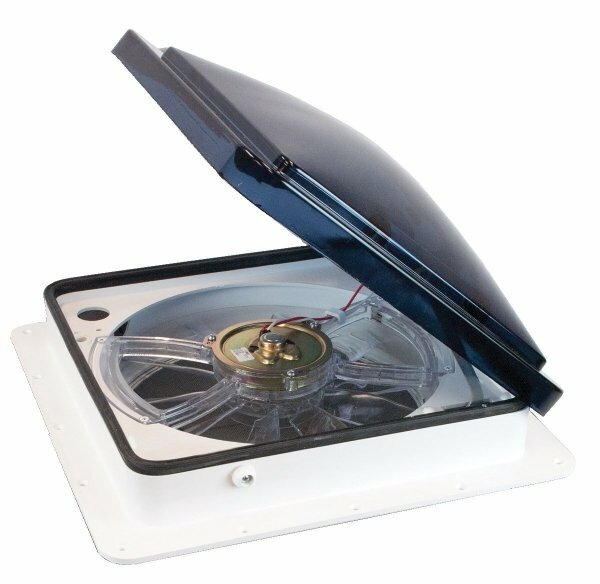 The fan should spin freely without wobbles or squeaks. Replace covers and fire up the AC. Run for 10-15 minutes and with an IR thermometer gun measure the ingoing and outgoing air temperatures. 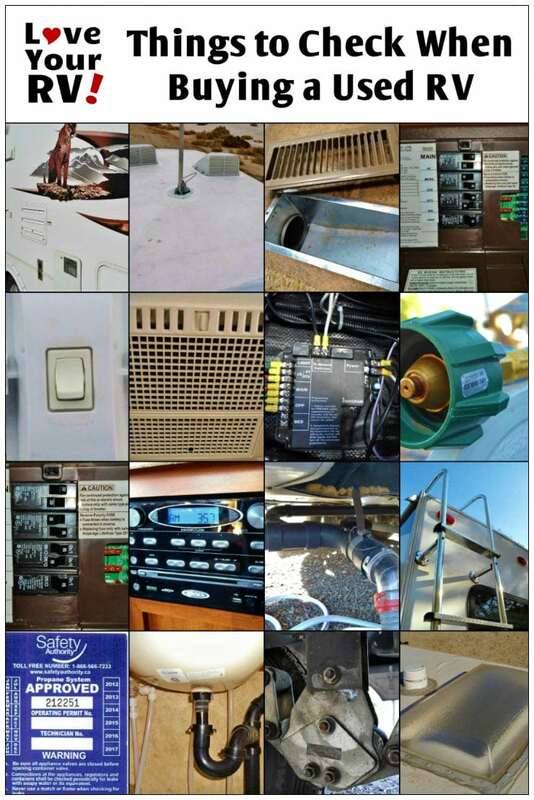 For most RV air conditioners a difference of 18-22 degrees would be considered normal. Check cooling and exhaust vent fans for proper operation. Make sure bug screens are installed and in good condition. Run all three through their full range of motion. They should move smoothly without squeaks, squeals or clunks. Inspect the rubber seals on the slide outs and the awning material for wear or damage. Inspect all the mechanical parts looking for any damage, rust or corrosion. If you have easy access to the drive motors, feel them making sure they don’t get too hot when working. 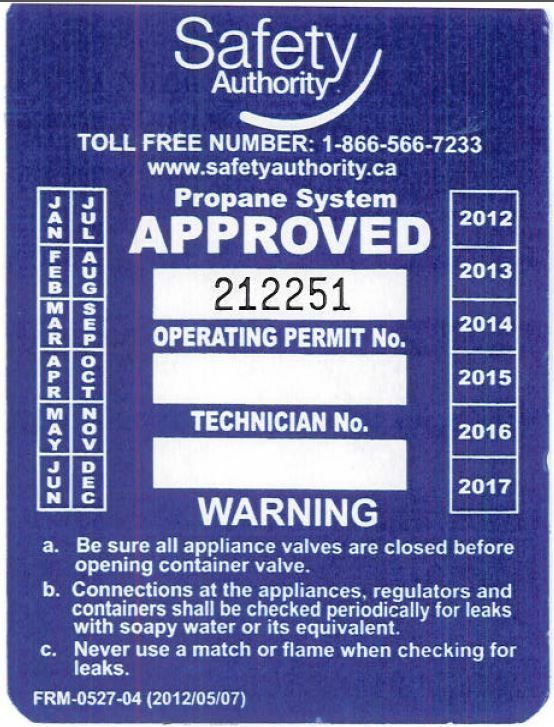 Confirm that the RVs LP Gas system has been inspected and certified. In most jurisdictions, it’s the law before sale. Even so, have a look for yourself. 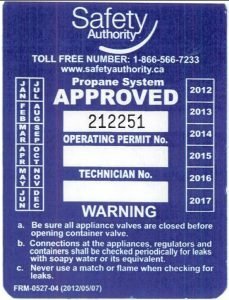 Check the age of the propane cylinders; many are only viable for a refill for ten years. Look at the condition of the rubber hoses, regulator and tank switch over valves. Move all around the RV inside and out sniffing for any sign of a propane leak. 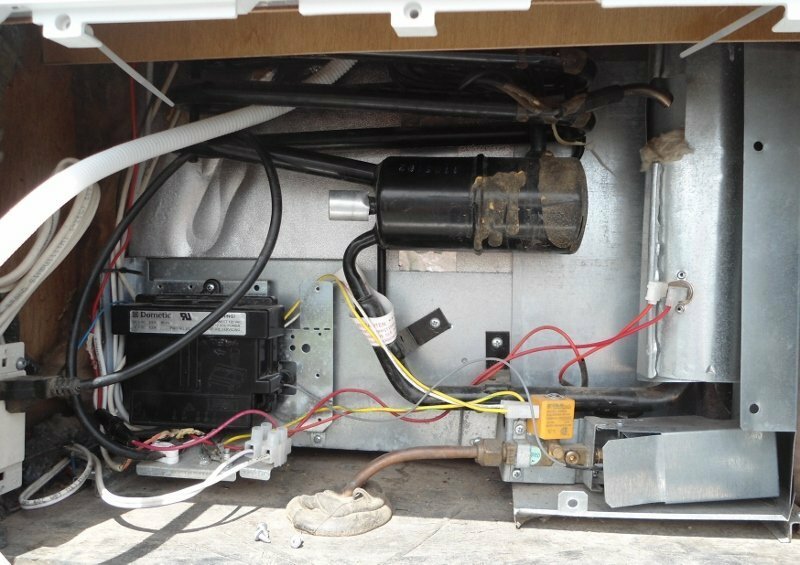 Make sure the RV gas furnace fires up quickly and the fan doesn’t have any squeaks, squeals of rattles. Check each output vent for heat and decent air flow. Pop off the furnace access panel and see if the area around the furnace is clear of dust and debris. Test the city water hookup. Fill the fresh water and waste tanks then take the RV for a spin. 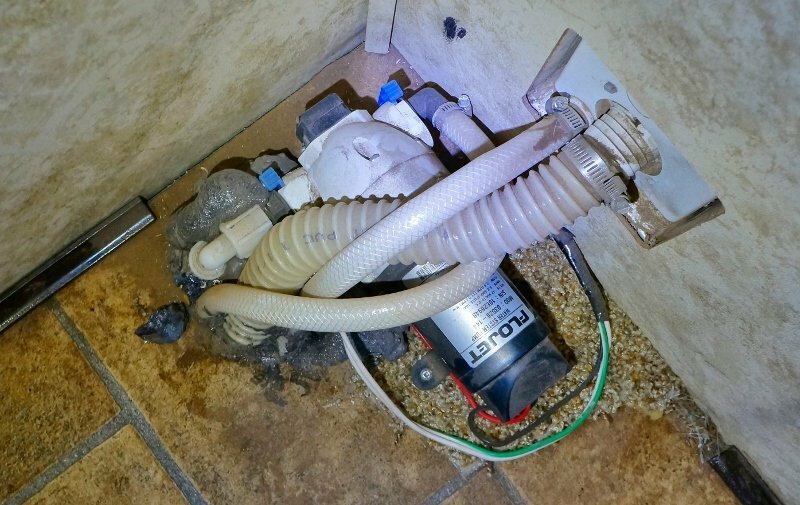 Check for any leaks under the RV. Dump all the waste tanks looking for good flow and a smooth feel to the waste gate valves. Locate and inspect the 12-volt fresh water pump. Check condition of wiring and hoses. Run it and listen for smooth operation while checking it for leaks. See if it can supply a consistent stream to all faucets. Try turning on/off all faucets looking for good flow and no leaks. Make sure the drains work properly. Look around the toilet for any sign of leaks and check the bowl seal. It should hold water. Check shower head and the seals on the door and stall walls. Confirm that all appliances are in good working order. If one is present, light the LP gas stove checking each stove top burner and the oven. Use an oven thermometer to test for adequate heating. Test the fridge in electric and gas mode. 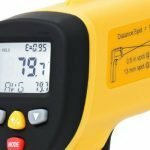 With an IR thermometer gun check the temperatures in the freezer and fridge sections for proper cooling. Open the outside access panels and make sure everything looks clean with no debris. Check condition of the drain hose. Confirm the auto switch over feature is working. When the electricity is removed, you should hear a sparking noise outside and be able to see a tiny blue flame in the burner area. Check operation of any TVs, Audio Systems, Satellite, DVD and remote controls. Check all speakers for clear sound, don’t forget the outside ones. If possible, hook signal to the outside cable input to confirm its functionality. Test the rooftop antenna and it’s signal booster. 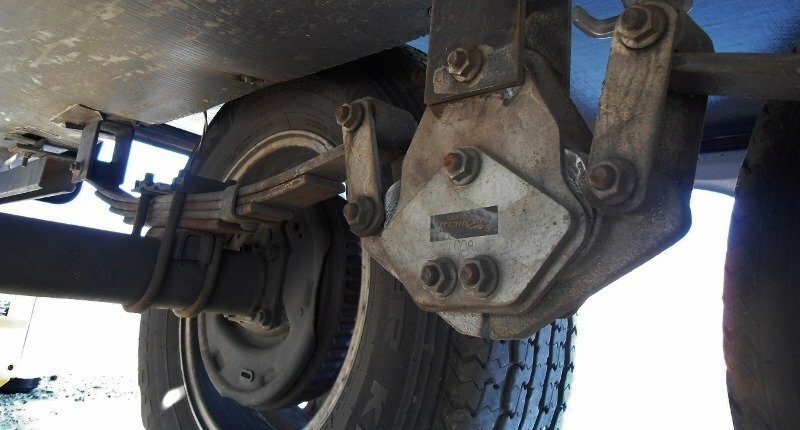 Crawl under the RV and have a look at the axles and suspension components. Look for any broken parts or excessive corrosion. Have a look at the condition of the underbelly covering. Inspect the tires for defects and use the DOT code to find out their age. Any tires older than 5-7 years are due for replacement, especially if the RV is a trailer. Inspect and test operation of the entrance stairs. Check bumper and pull out bike rack. Check for functioning smoke, carbon monoxide, and LP gas detectors. Look for one or more up to date fire extinguishers. Finally, grab yourself a powerful flashlight and go all around the RV looking into every nook and cranny. Open all the cabinets and storage bays. If possible, unscrew any access panels and have a look inside. Undo a few sections of the underbelly and have a gander in there too. Serious problems to look for are signs of water leaks, dry rot, mold or rodent activity. 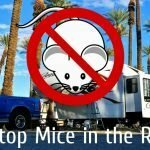 As a final tip – Pay close attention to the state of the hidden areas of the RV which most sellers will miss during clean up. For example, the sink drains, behind access panels and inside the roof and furnace vents. 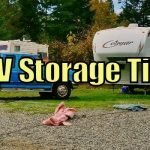 If these areas are in a pristine condition you can bet the RV hasn’t seen too much use and has been stored in a good location. 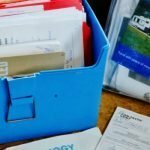 I hope you have found this article helpful for your used RV buying quest. 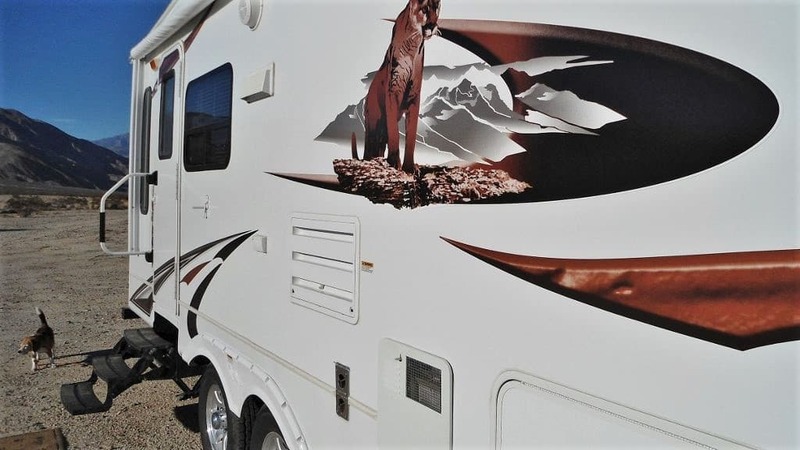 It’s an exciting time hunting for that perfect RV. But, take your time to thoroughly check over prospective rigs. It will guard against possibly much more wasted time, expense and huge disappointment down the road. Also, discovered defects will give you some ammunition during the negotiation phase to get a lower price. 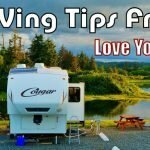 For more useful RVing Tips be sure to check out the Love Your RV! tips archive.